The International Coherent Amplification Network (ICAN) sets out a new laser system composed of massive arrays of thousands of fibre lasers, for both fundamental research at laboratories such as CERN and more applied tasks such as proton therapy and nuclear transmutation. The results of this study are published today in Nature Photonics. Lasers can provide, in a very short time measured in femtoseconds, bursts of energy of great power counted in petawatts or a thousand times the power of all the power plants in the world. Compact accelerators are also of great societal importance for applied tasks in medicine, such as a unique way to democratise proton therapy for cancer treatment, or the environment where it offers the prospect to reduce the lifetime of dangerous nuclear waste by, in some cases, from 100 thousand years to tens of years or even less. However, there are two major hurdles that prevent the high-intensity laser from becoming a viable and widely used technology in the future. First, a high-intensity laser often only operates at a rate of one laser pulse per second, when for practical applications it would need to operate tens of thousands of times per second. The second is ultra-intense lasers are notorious for being very inefficient, producing output powers that are a fraction of a percent of the input power. As practical applications would require output powers in the range of tens of kilowatts to megawatts, it is economically not feasible to produce this power with such a poor efficiency. To bridge this technology divide, the ICAN consortium, an EU-funded project initiated and coordinated by the École polytechnique and composed of the University of Southampton’s Optoelectronics Research Centre, Jena and CERN, as well as 12 other prestigious laboratories around the world, aims to harness the efficiency, controllability, and high average power capability of fibre lasers to produce high energy, high repetition rate pulse sources. The aim is to replace the conventional single monolithic rod amplifier that typically equips lasers with a network of fibre amplifiers and telecommunication components. Dr Bill Brocklesby from the ORC adds: “A typical CAN laser for high-energy physics may use thousands of fibres, each carrying a small amount of laser energy. It offers the advantage of relying on well tested telecommunication elements, such as fibre lasers and other components. The fibre laser offers an excellent efficiency due to laser diode pumping. It also provides a much larger surface cooling area and therefore makes possible high repetition rate operation. 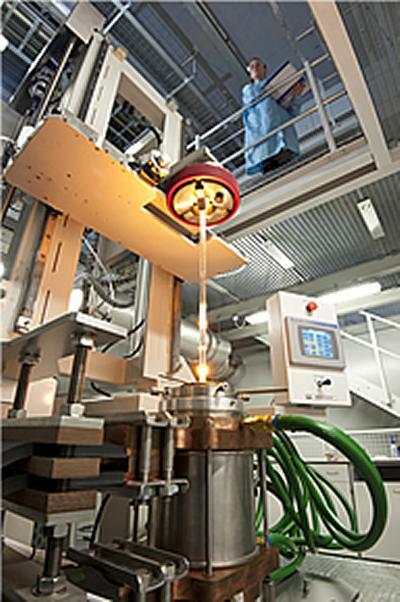 Such a combined fibre-laser system should provide the necessary power and efficiency that could make economical the production of a large flux of relativistic protons over millimetre lengths as opposed to a few hundred metres. One important societal application of such a source is to transmute the waste products of nuclear reactors, which at present have half-lives of hundreds of thousands of years, into materials with much shorter lives, on the scale of tens of years, thus transforming dramatically the problem of nuclear waste management. CAN technology could also find important applications in areas of medicine, such as proton therapy, where reliability and robustness of fibre technology could be decisive features. CERN, the European Organisation for Nuclear Research and home to the LHC - world's largest and highest-energy particle accelerator. 3. Experts from other related organisations such as KEK (Japan), MPQ, Garching, ONERA, Institute of Optics (France), University of Michigan and University of Oxford bring their own areas of expertise to the project. A series of workshops and conferences will be held until July 2013, at which stage the first hardware designs will be summarized for a single-stage demonstrator laser system aiming for > 10 J per pulse, > 10 kHz performance with pulses of 100-200 fs. The main results of the work done by the ICAN consortium will be announced and discussed at a conference taking place at the CERN on June 27-28, with the participation of prominent academic institutions as well as industrial companies, among which is Thales.